Price and utilization are the two basic components of the nation's healthcare tab, and wild differences in prices for common medical procedures appear to be driving it up. One of the most comprehensive, independent studies of commercial healthcare prices shows that employers and insurers that provide private health coverage can pay a lot more for services depending on the state where people live, even for routine procedures such as MRIs and ultrasounds. 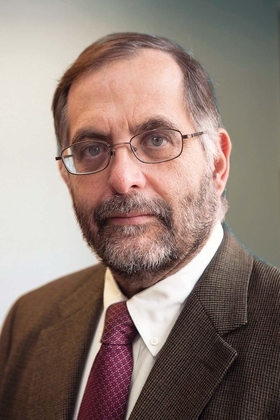 “As we think about policy responses to try and rein in increases to healthcare prices, the responses are going to have to be nuanced,” said David Newman, executive director of the Health Care Cost Institute, who led the study. Parts of the Affordable Care Act were conceived to control health spending through value-based arrangements between payers and providers. The goal is to reward hospitals and doctors who have both low costs and great outcomes for their patients. The ACA has implemented some of these reforms through Medicare, but the commercial market has relied on providers and insurers to reform on their own. The Health Care Cost Institute's study analyzed 3 billion medical claims from Aetna, Humana and UnitedHealthcare during 2012 and 2013, constituting about 25% of the commercially insured market. The data also represent prices actually paid to hospitals and doctors—which generally are more important than the prices that are charged—but are difficult or sometimes impossible to obtain because of gag clauses in contracts. Researchers found the national average price for up to 242 common services—from lab tests and X-rays to more extensive procedures such as hip replacements and angioplasties—varied extensively across states as well as within metropolitan areas. For example, the average price for a knee replacement in South Carolina paid by one of the three large for-profit insurers was almost $47,000; yet the average price of the same bundled procedure in New Jersey totaled only $24,000. “As we think about policy responses to try and rein in increases to healthcare prices, the responses are going to have to be nuanced,” said David Newman, executive director of the Health Care Cost Institute. In Cleveland, the average price paid for a pregnancy ultrasound was $522. But just 60 miles away in Canton, Ohio, the average price was $183. 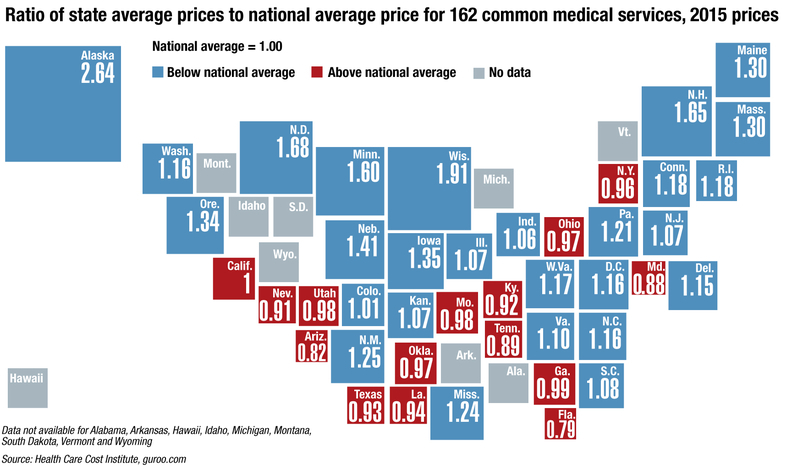 States with the highest average prices, compared with a national benchmark, included Alaska, Minnesota, New Hampshire, North Dakota and Wisconsin, while prices in Arizona, Florida, Maryland and Tennessee were much lower than the national average. Although researchers did not analyze the root causes behind the price variation, they said geographic differences in costs certainly play a role. “Everything in Alaska, other than snow, is more expensive than elsewhere in the country,” Newman said. Variation in housing, rent and salaries also may justify some of the gaps. However, “the remaining variation is most likely due to differences in underlying market dynamics, such as varying market power, a lack of transparency or the availability of alternative treatments,” Newman and other authors wrote in Health Affairs. Indeed, other researchers who used Health Care Cost Institute claims data theorized last year that hospital consolidation often drove up prices unjustifiably. At the very least, Newman said, employers, payers and consumers could save money if they knew just how different the prices were. He joked that employers or insurers could drive a knee-replacement patient from Palm Bay, Fla., down to Miami, give him a couple thousand dollars in casino chips and then drive him home—and still save money. The average knee replacement price in Palm Bay was $44,237, compared with $27,115 in Miami. The Blue Cross and Blue Shield Association has released similar findings on price with data from its member plans, and Castlight Health found its employer clients also pay wildly different prices for the same procedures depending on where people live. However, the Health Care Cost Institute also has found that patients who shop for services based on price may have only “modest” effects on healthcare spending because they have little to no market power to negotiate prices.